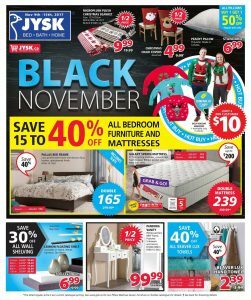 JYSK Flyer Black Friday Sale 14 November 2017 provides an ultra perfect comfortable life. For a limited time all beds on sale at JYSK. Celebrate Black November deals with amazing prices. Its right time to change your all bedroom needs before Black Friday deals ends. You can save up to 40% Off all bedroom furniture and mattresses. Low profile bed framed with brown faux leather upholstered finish bed only for $165. It was $400. Today I am going to check this bed. I prefer low profile bed always. All your home needs available in JYSK Flyer Black Friday Sale 14 November 2017. Not only bed or mattresses but also kitchen and bathroom needs available for good prices.Let’s discover the newest products today. If you have JYSK Card, you can save extra 10% off from all your $300 or more shopping. JYSK high quality products can easily change your home style. Make your home great again! If you are thinking to change your furniture, it is the right time!